Stories are important for a community to understand, own, and be enchanted with the place in which it lives and works. The Sidewalk Constellations project creates narratives in public spaces to celebrate, record, archive and make accessible the contemporary mythologies and issues which exist in various urban communities. A few years ago I was walking round the ferry port of Toronto when I noticed a generous dotting of gumspots on the ground. It occurred to me that if those gumspots were joined together with white lines they would look like maps of constellations. I duly reached into my pocket and with a stick of chalk got to work. The groupings of real stars are just as arbitrary as gum spots, pure pareidolia. It is stories which give them shape and meaning and the dirty blobs on the pavement are just as embedded in narrative. Each gumspot has been in someone’s mouth, a short part of his/her/their life that is discarded on his/her/their journey. When several journeys cross, a sidewalk constellation is formed. 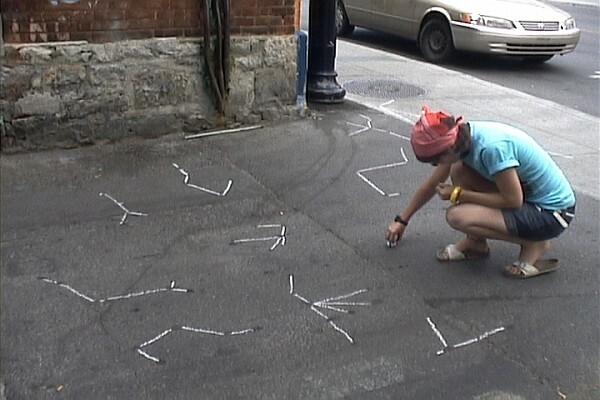 When I go to a town or city to do Sidewalk Constellations, I chat to a lot of people. I think about what I’ve gleaned from them as I join up gum and draw the resulting constellation. I walk around the place and roll around the info-lint until the stories are made, stories that make sense of the random events that brought those pieces of gum together. I record the stories and leave them in places I’ve chalked or met people. ArtScape International Artist Residency, Toronto; street performances, Montreal; Eyelevel Gallery, Halifax.